But of late I was bored of my straight manageable hair and wanted my wavy, little frizzy hair back. 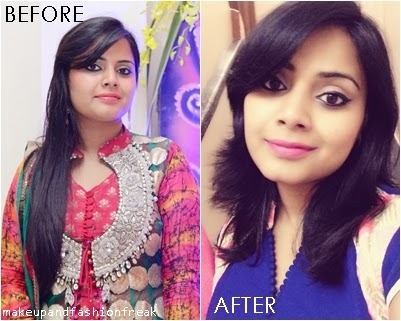 Before giving it a second thought I went to the Lakme Salon and got my long hair chopped to shoulder length. Only after getting my hair chopped, I realised how dry my hairs had become after all the abuses. I really wanted to follow a better Hair-Care Regime. While going through Shrish's Hair Care Routine post on StyleFashionEtc, I couldn't help myself and jumped into the Moroccanoil bandwagon. So far, I have used the shampoo a couple of times and I must say I am pretty impressed. Will do a detailed review post when I have used enough of the product.